Last week, I stumbled upon a post from Nicole Gulotta, of The Giving Table, that just tugged at my Mama heart-strings, and I couldn’t just sit by without taking a stand. She has presented some staggering facts that you just can’t ignore. * 1 in 4 kids in the U.S. do not know where their next meal will come from. Look around at 4 of your kids’ friends. Which one isn’t sure if there will be dinner on the table tonight? When you think of it as a personal issue like that, it strikes you hard. * Food Stamp participants are only given $4 a day to survive. a DAY! I hope that makes you think twice about your $4 lattes… just sayin’. * SNAP – the food stamp program – is at risk of severe cuts. What will that mean for the millions of Americans who will be effected? What will that mean for the children who already struggle to get a home-cooked dinner at night? 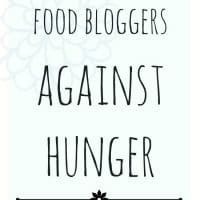 Food Bloggers Against Hunger has been created in response to the new documentary from Participant Media, A Place at the Table. These are the same people who brought you Food, Inc. Please take a few moments to watch the touching trailer for the documentary. So what can you to do make a difference? * Take just 30 seconds (or less!) to send a letter to congress to support anti-hunger legislation. This link will take you right to where you need to go to make this happen. It’s super simple, and the more letters we submit, the better. * I encourage you to see the film either in your own city or on demand through iTunes or Amazon. Many of us live a comfortable life, or at least a life where we are able to eat and feed our children, every single day. I know that the moment my son tells me he is hungry, it’s usually only a matter of minutes until I put a healthy snack in his hands or start preparing dinner. I’m sure you treat your children and their needs fairly similarly. What if you weren’t able to fulfill one of their most basic needs? What if you had to tell them you didn’t have anything for dinner that night? How would that make you feel? How would you calm their growling tummies and hunger pains. What exactly would you do? As a Mama, I just can’t imagine a life where I couldn’t feed my family, and it truly breaks my heart to even go to that place in my head. Please, just take a minute out of your day to take a stand against this cause. I cannot stand to think about hungry children in the U.S. I have created a recipe for this cause, in hopes that those struggling with economical hardships will still be able to provide a meal for their families every night. At first glance, looking at the receipt for this meal, I wasn’t quite sure it would be doable, given the average amount of money each family is given on food stamps. But then I got to thinking. This meal costs just under $10 to make. But it serves 10 people. For a family of 5, that is 2 meals. When broken down, this recipe costs just $0.96 cents per serving. That is something I can live with. 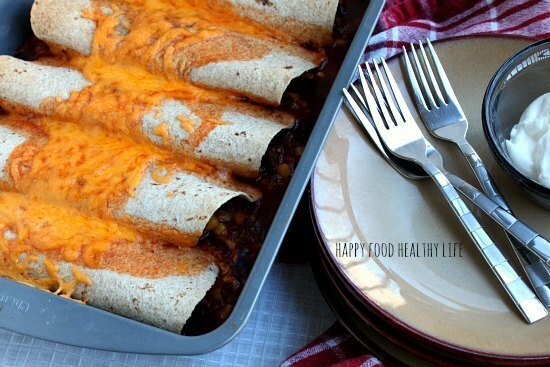 You could choose to freeze one pan of 5 enchiladas, and save it for another day. 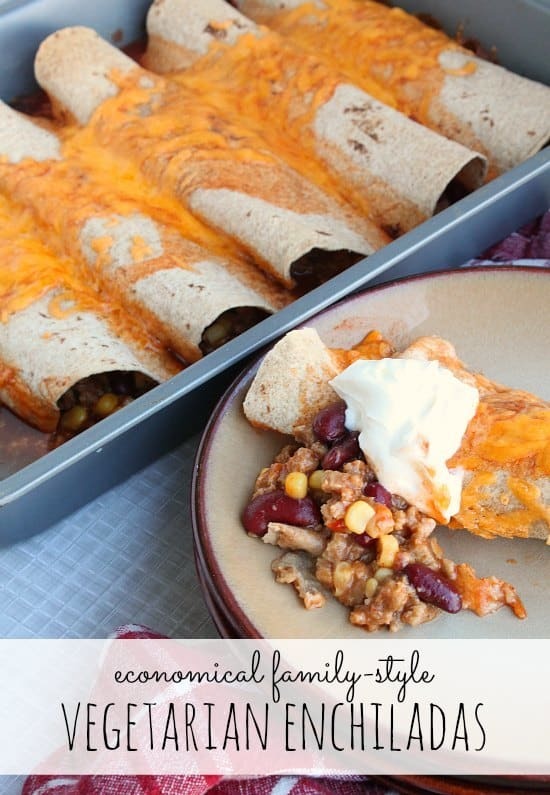 Or you could have them for leftovers later in the week. Or mom and dad could take one each for lunch the following day. Or of course, you could always split the recipe in half and use the crumbles, corn, and beans to start off a chili recipe later in the week. There are ways to make this an economically-friendly meal, by being creative with the way you portion things out. Preheat oven to 350F degrees. Lightly grease a 9x13 pan (or two 8x8 pans,1 freezer-safe, if you are going to be freezing one pan for later). Mix soy crumbles in a bowl, with kidney beans, corn, and 1/2 cup of enchilada sauce. Stir to combine. Add a 1/4 cup of the mixture to a tortilla, roll up to enclose filling. Place seam-down in pan. Continue with the rest of the mixture, either putting all 10 in large pan or splitting them equally into 2 separate pans for a later meal. Top with remaining enchilada sauce and cheese. Bake for 20-25 minutes. This is so great! I love that you are raising awareness about this issue. Thank you so much for your support. It is a cause I feel strongly about and hope enough people see our posts to actually make a difference! Thank you for coming by and also for your support in the cause. I love how many people are coming together to strengthen our numbers in the cause. I’m also finding some really delicious recipes along the way! This is a great issue that needs a lot of attention. People all over the States should become aware of this. I hope that we can touch lives and people that might not be able to do something. Already have started to make meals for some people that are close to us that can’t afford it. It’s done out of compassion, not to be looked at any other way. Love is a action word. I agree with you Robert! 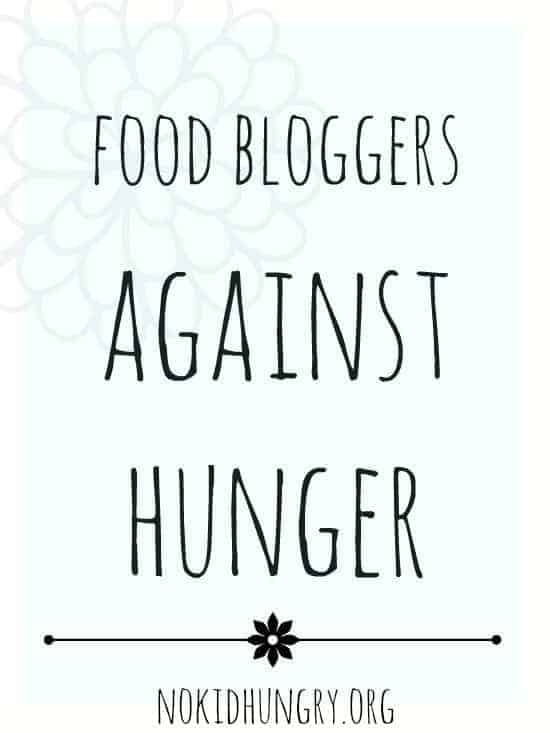 So many people are focused on the hunger the human race suffers in 3rd world countries that we are forgetting about those in our own back yard suffering. That is so wonderful that you are taking a stand and making changes in your own world. There needs to be more like you! Thank you for coming by! LOVE the meal you created for this! it looks amazing.. Thanks Heather! I knew that I wanted to create something that would feed a lot of people, and mexican food is generally quite economical.